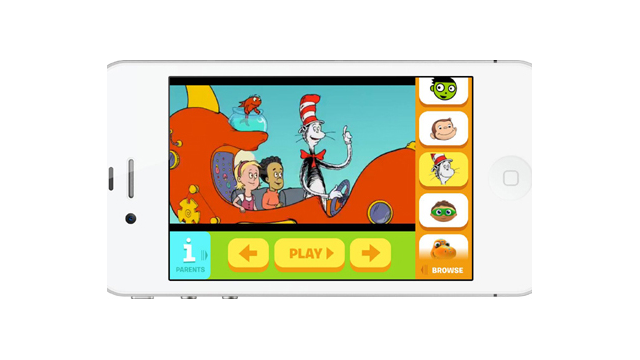 Arlington, VA – Dec. 6, 2011 – PBS KIDS today announced the PBS KIDS Video App is now available on iPhone and iPod touch, bringing more free educational video content to families than any other children’s media app. The app gives families free, streaming access to more than 2,000 videos – including clips and full episodes – from their favorite PBS KIDS series. The PBS KIDS Video App launched on iPad in May with great success; it has served more than 430 million video streams – an average of two million per day – and has had over 450,000 downloads to date. Demand for high-quality, educational apps continues to rise, particularly as families plan to bring their mobile devices with them during holiday travel. In a recent survey3 conducted by PBS, parents ranked educational value as one of the top reasons for purchase (74 percent) when choosing apps for smart phones. The app includes clips and full episodes from PBS KIDS series like THE CAT IN THE HAT KNOWS A LOT ABOUT THAT!, DINOSAUR TRAIN, CURIOUS GEORGE, SUPER WHY, SESAME STREET, WORDGIRL and WILD KRATTS . The PBS KIDS Video App is available for free from the App Store on iPhone, iPod touch and iPad or at http://www.itunes.com/appstore. More information about PBS KIDS mobile apps is available on PBSKIDS.org/mobile. Images of the PBS KIDS Video App are available on PBS PressRoom. 1PBSKIDS.org served nearly 98 million streams in October 2011, according to comScore VideoMetrix 2October 2011, comScore VideoMetrix 3ORC’s online CARAVAN, October 26-31, 2011.